Four Iraqi prisoners have been transferred from the U.S. military detention center in Guantanamo Bay to Iraqi custody, two senior Iraqi security officials said Monday. The officials said the men had been arrested in Afghanistan, then transferred to Guantanamo, before being released to the Iraqis for questioning. The officials, who spoke on condition of anonymity because they were not authorized to speak to the media, did not give a timeframe for their arrests or release. "We have interrogated four Iraqi men who are now in our custody," one of the officials said, adding the detainees included a Shiite from Basra. He said one more Iraqi citizen remains at the U.S. naval base in Cuba and was seeking refugee status in the United States. The sister of one of the prisoners, Hassan Abdul-Hadi al-Jawhar, said the International Committee of the Red Cross confirmed her brother's release. The Red Cross said it would not comment on individual cases. President Barack Obama has ordered the detention center in Cuba to be closed within a year as part of his overhaul of U.S. national security policy. An estimated 245 men are being held; most of them have been detained for years without being charged. Neda Abdul-Hadi said her brother disappeared in 1999 while serving with the Iraqi military under Saddam Hussein in northern Iraq. After almost losing hope, she said the family received a letter from Hassan in 2004 saying he was in Guantanamo. "We received a handwritten letter from him almost every three months," she said. "He would only tell us about his well-being and send his love to the family, but nothing about his arrest or why he was in Guantanamo." She said the family, which lives in Basra, 340 miles southeast of Baghdad, heard through news reports that her brother was one of four people now in an Iraqi prison run by the Ministry of Justice. "I never knew him to be overly religious or extreme in his faith," said Abdul-Hadi. "We just want to know where he is." Thousands of Iraqi security forces were meanwhile deployed along routes leading to the Shiite holy city of Karbala to protect pilgrims marching there for religious rituals this week. Attacks by al Qaeda in Iraq, other Sunni insurgents, Shiite extremists and a Shiite cult have killed hundreds of people during pilgrimages in recent years. Underscoring the dangers, a roadside bomb killed two pilgrims Sunday in Baghdad. Iraqi soldiers also discovered another explosive south of the capital believed to have been placed to target those making the trek on foot. About 40,000 soldiers and police officers have been stationed in the area, including a main road linking Karbala and the holy city of Najaf to the south, said Maj. Gen. Abdul-Karim Mustafa, Najaf's police chief. In addition, hundreds of security cameras have been mounted and air patrols are being conducted along the less trafficked routes. "We want to deny any terrorist the opportunity to mar the occasion," said Maj. Gen. Ali Jassim Mohammed, Karbala's police chief. Hundreds of thousands of Shiite pilgrims are expected to visit Karbala by next Monday to mark the end of 40 days of mourning that follow Ashoura, the anniversary of the seventh century death of the Prophet Muhammad's grandson Hussein. He was killed in a battle for the leadership of the nascent Muslim nation following Muhammad's death in 632. In January, a suicide bomber killed at least 38 people at a Shiite shrine in Baghdad during celebrations marking Ashoura. Security also was tight at the Najaf airport where more than 40 flights carrying pilgrims from as far away as London, Pakistan and India were expected to arrive within the week, said Safa al-Furati of the United Arab Emirates-based Jupiter Airlines. 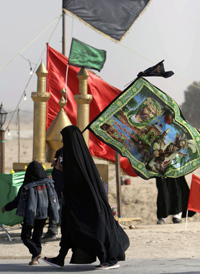 Last year, about 5,000 pilgrims flew to Najaf to begin the pilgrimage to Karbala, he said. This year, more than 20,000 were expected, he said.